Like his family members now Robert Vadra too out on bail. Barred from going abroad. Now Robert Vadra too is out on bail like his mother-in-law Sonia Gandhi and brother-in-law and Congress President Rahul Gandhi in a money laundering case. The Court while granting anticipatory bail to Vadra on a surety bond of Rs.Five lakhs (Rs.500,000) prevented him from traveling abroad. General Secretary Priyanka’s husband Vadra will need to get the Court’s approval for making foreign trips. ED said it has received information about various new properties in London which actually belong to Vadra, including two houses of five and four million pounds each and six other flats. Special Judge Arvind Kumar also directed him not to tamper with the evidence or influence witnesses and join the investigation as and when called by the investigating officer. Vadra is facing charges of money laundering in the purchase of a London-based property at 12, Bryanston Square worth 1.9 million pounds. In its order granting the relief, the court noted the submissions made by senior advocate A M Singhvi, appearing for Vadra, that the accused has joined the probe as and when called by the investigating officer. The case of Enforcement Directorate (ED) is mainly based on documentary evidence, it said. The court also observed that Vadra’s office premises were searched on December 7 and 8, 2018 and the voluminous documents, nearly 20,000 pages, were seized. “The accused (Vadra) has joined the probe as and when called by the investigating officer. Vadra had joined the investigation on nine occasions from February 6 to March 8 and has been interrogated for about 58 hours and answered the questions put to him,” it said. During arguments, Vadra accused ED of its lust to put him in custody. ED’s Prosecutor shot back by saying as long as you are involved in money laundering we have lust to to put you in custody. ED’s special public prosecutors D P Singh and Nitesh Rana had opposed Vadra’s application, saying he was “needed to be dealt with custodial interrogation and that there was a risk of tampering with the investigation”. Rana had told the court that there was fresh evidence in the case, including an e-mail trail in which the purchase and renovation of the London-based property was discussed. “The anticipatory bail needs to be dismissed. Robert Vadra needs to be dealt with custodial interrogation,” ED had told the court. ED’s lawyer A R Aditya had accused Vadra of politicizing the matter. The court also granted anticipatory bail to Manoj Arora, an employee of Vadra’s Skylight Hospitality LLP and a co-accused in the case. Priyanka was the promoter of Skylight Hospitality and later resigned when controversies started coming out. It noted that it was clear from the records that the present case was registered on the basis of Black Money Act (Undisclosed Foreign Income and Assets) and Imposition of Tax Act regarding which a complaint had already been filed against Sanjay Bhandari (arms-dealer) and the proceeds of crime allegedly relate to the said offence. Therefore, the present complaint cannot be said to be an extension of any case registered by the ED relating to the properties of Vadra in Rajasthan, the court said. According to ED, it lodged a money laundering case against Arora after his role came up during the probe of another case by the Income Tax Department under the newly enacted Black Money Act and tax law against absconding arms dealer Sanjay Bhandari. PGurus had earlier reported that Hindustan Times’ Executive Editor Shishir Gupta was in regular touch with the fugitive arms dealer Sanjay Bhandari. ED alleged that the London-based property was bought by Bhandari for GBP 1.9 million and sold in 2010 for the same amount despite incurring additional expenses of approximately GBP 65,900 on its renovation. “This gives credence to the fact that Bhandari was not the actual owner of the property but it was beneficially owned by Vadra who was incurring expenditure on the renovation of this property,” the ED had told the court. Why isn’t Vadra behind bars? Has the Government come to an ‘ agreement’ with The First Family? Can someone submit a PIL to the supreme court asking why his passport should not be asked to be surrendered? He can just fly away never to return and his family can join him later. He has supposedly have enough properties abroad anyway. How much the judge got from Vadra?? But, there is a section of the media trying to say that Amit Shah said they never talked about putting Vadra in jail. How naive and illogical are these people, how can anybody be put to jail unless proved that he is guilty. 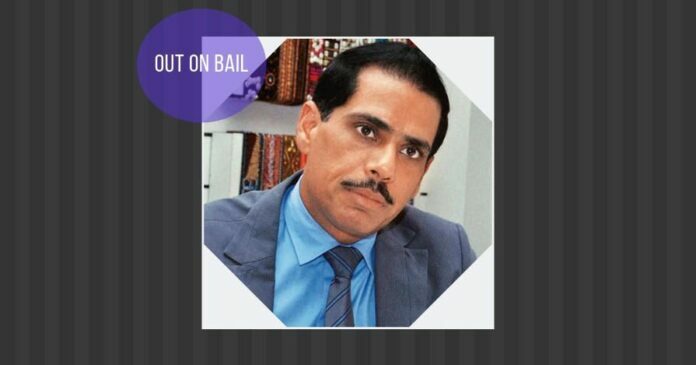 Having granted the bail is making some feel that Mr. Vadra has been absolved of the crime. And surprisingly never seen Mr. Bhushan or a Rathee ever comment about Vadra on twitter. They should at least congratulat Vadra on twitter and wish him all the best. Vadras stature raised to the level of his mother-in-law and brother-in-law.congratulations.